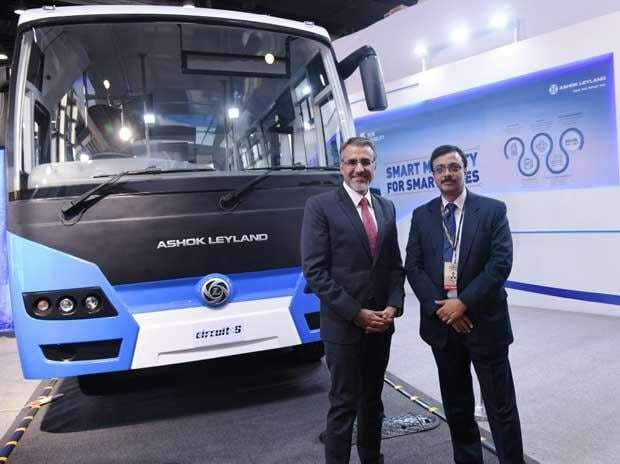 Commercial vehicle major Ashok Leyland unveiled its first electric bus, Circuit-S, with the swappable battery technology of Sun Mobility, at the AutoExpo 2018 on Wednesday. Sun Mobility is a joint venture led by Chetan Maini, previously founder of Reva (now Mahindra Reva), and Uday Khemka, vice chairman of SUN Group. Ashok Leyland and Sun Mobility in July 2017 had announced a collaboration on electric vehicle projects using the latter's swappable Smart Battery technology. Designed for Indian conditions with a seating capacity of 25-35 seats, the electric bus runs on easily swappable, smart batteries that are small and one-fourth the weight of a regular Li-ion battery. The partners also showcased the vehicle refueling process in which its electric buses get swapped in under four minutes -- much faster than conventional refueling -- along with the swapping of bus drivers and conductors at a depot. Vehicle swapping is possible because the battery is separated from the bus. This solution, thereby, addresses issues of convenience and quick recharging options that have long been stumbling blocks for the acceptance and viability of electric vehicles for public transport. “Our vision is to transform public transportation by designing, developing, and marketing a breakthrough, India-specific solution that makes our city buses emission-free, cost-effective and scalable,” said Vinod K Dasari, managing director, Ashok Leyland. “The Circuit-S bus will be cheaper, requiring minimal maintenance owing to fewer moving parts, and lighter owing to smaller battery pack. Most importantly, it will have zero tailpipe emissions. We certainly see this technology solution as the biggest enabler for our STUs and the biggest contributor to our nation’s mobility vision of becoming 100 per cent electric,” he added. The company claims that by separating the battery from the bus for the first time, the upfront cost of the bus is drastically reduced to be at par with a traditional diesel bus. The bus is designed for Indian mass transport usage as the compact and light form factor of the battery allows for more passenger space and standing room. The swappable technology is compatible across a variety of bus platforms and works on the pay-per- use model of battery consumption. This brings down the total cost of vehicle operations; both maintenance and energy. Sun Mobility plans to build a network of Quick Interchange Stations that are easy to install and ensures quick refueling of busses to reduce down-time. The interchange station is customised for Indian conditions ensuring optimal use of real estate space for a range of vehicles to be swapped. These stations are compact and modular, allowing flexibility of shifting basis demand in a cost-effective manner. The Smart Network helps keep a constant check on the battery vitals, station operations and enables fleet management. Ashok Leyland has brought out the solution to market within seven months of partnership with SUN Mobility. This can change the way the public transport system in India works and this could be a proper home-grown solution for the Transport Authorities in the country. In 2017, Ashok Leyland has developed and introduced an EGR based BS-IV solution, called iEGR (Intelligent Exhaust Gas Recirculation). “The future of public mobility is undoubtedly electric. The Sun Mobility way combines smart batteries, quick interchange stations, clean energy – all linked to a smart network that for the first time brings truly disruptive innovation to the part of Urban Mobility that has the greatest impact on the way people commute,” said Chetan Maini, co-founder and vice chairman, Sun Mobility. “Partnering with a market leader like Ashok Leyland, we have been able to bring to life, mass mobility solutions that are customized for India’s widespread public transportation needs,” he added.